New release (20140722) of CM11.0 for S3 Mini is available! the new kernel version are implemented? Omni stopped the work ? And communication with other lifeforms in the galaxy. It’s a Samsung Galaxy right?!? Guys, please tell a bit more about what we can expect from this! * The layout of the buttons on the dialing screen is bad after installing updates from the recovery. * The battery lasts a very short. * The device loses signal frequently and need to restart to reconnect to the network. * Please enable some option to increase the resolution of contact pictures. * The “Search phone” option is disabled after installing updates from the recovery… ¿how do I enable it again? * Please enable any option to lock the desktop icons to not move or delete icons accidentally. * Some Apps (Like GO Backup & Restore) not recognize the external memory card. when will update the linux kernel 3.0.101 to 3.4 or 3.6 or 3.10? Tomorrow morning at 6.30am so by dinner time they can start implementing Android L for next friday. Start work on Android M.
Creo que en si nuevo parece que nada yo la instale porque tenia mucho que no actualizaba y ya tenía errores pero hasta donde veo al menos no tiene ningún bug grande más que los conocidos. phi, it`s nothing. i think about gorilla glass, IP68 dust & waterproof and Iridium FDMA i TDMA connectivity. But I`m asking for facts. the last 3 releases were much more stable for me than the last milestone M8! Hey guys. Can upload the roms and files in other servers? Like Mega or Zippyshare. Sorry bro they don’t allow mirrors. When upgrading the battery is consumed too fast, but then charging, consumption is normalized. ** Dear anybody who can help me 🙂 I have some issues with my phone (the mini). Does anyone of you know a good place to ask for advice? It’s about programs/widgets disappearing all of a sudden, and some stuff I don’t know what caused it. Wipe everything except sd, spends f2fs cache, install the ROM, DATA happens to f2fs and reboot. This includes kernel update also ? What do you mean with “Nouuuu!” ?!? “Nou” in romanian means “new” but i guess it’s not the case. ya tenemos el kernel e recibido correo de Samsung pero no se muy bien cual elegir como lo hacemos Nova? No, todavía no está el kernel. Samsung sólo dijo que lo va a estar poniendo disponible en algún momento pero ni siquiera dieron precisiones de cuando. Una vez liberado, esperemos, los desarrolladores lo van a incorporar a la rom. Es una muy buena noticia la de Samsung, pero los resultados no son inmediatos. 🙂 unbelievable fast – I guessed it would take them weeks to release the code. 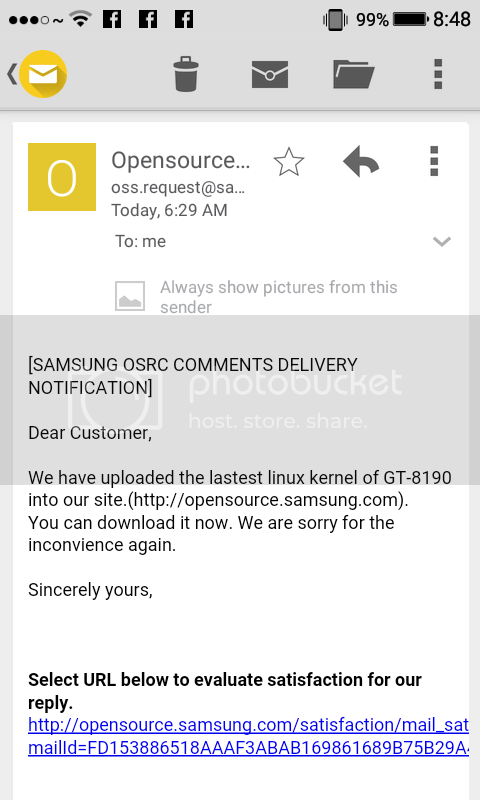 We have uploaded the lastest linux kernel of GT-8190 into our site.(http://opensource.samsung.com). You can download it now. We are sorry for the inconvience again. The one in the latest source code? Or did I take the wrong one…. Thanks for the roms. May I ask you a favor?, can you add start sound to Cyanogenmod and Carbon? At http://opensource.samsung.com/reception/receptionSub.do?method=sub&sub=F&searchValue=i8190 , which of the files is the right one/ the most recent one to download? Does anyone has battery issues? eu recebi o email da sansung confirmando o novo kernel para download. Si esta actualización del kernel hace que vuelvan a incorporase los botones de abajo SOY MUY FELIZ!! No tengo mucha idea si esto puede mejorar mucho mas duracion de bateria y rendimiento, pero como ya dije, con los botones de abajo SOY FELIZ!! If this kernel update makes return to incorporate the MENU and BACK buttons, I AM VERY HAPPY! I have no idea if this can be too much to improve battery life and performance, but as I said, with the buttons below I’M HAPPY! Novafusion, when next release which integrated with latest kernel come…? cuando e puesto a cargar el teléfono al llegar al 100% se desconecta solo…….Nova mirar que la nueva actualización no tenga ese problema……. impaciente por probarla…..saludos y buenos días en Eepaña. To install CM11 Carbon from 4.4.2 as I have to give? I can move from Carbon to CM11? if so how to do it? Anyone else not able to install WhatsApp?? I just dont have the same amount of contacts on Telegram as I do on WhatsApp…..Any ETA on the problem guys? Otherwise great work…and I sense your busy little bees with the new update from Samsung. Looking forward to the new kernel release! I had problems with whatsapp using ART, I returned to Dalvik and now all is ok.
me hace pensar que el hecho de que no nos comenten nada y no pongan ninguna entrada referente al nuevo kernel Liberado es que están trabajando duro y nos tienen una Super Milestone de sorpresa :’) ojala no me equivoqué. Para mi todo a trabajado muy bien excepto la cámara. Aun las fotos no tienen la misma calidad de la rom stock, sobre todo en interiores, de noche, usando el flash. La diferencia es muy grande. Mi esposa aun tiene la rom stock y comparo mi teléfono con el de ella y el mio supera en casi todo al de ella, el unico inconveniente que noto es en la calidad de las fotos y videos. debe ser la aplicacion, yo compre una en el play store, snap HDR, hasta ahora la mejor aplicacion de camara que he encontrado, y las fotos salen aun mejor que las del stock rom, hay un trial si la quieres probar.